Per the last option, I direct my readers to the Shang Palace Restaurant at the Shangri-la Hotel in Ningbo, China where, per chef’s instructions I suppose, shrimp dumplings are served with a light garnishment of 24k gold leaf. If I were an Old Testament prophet, a Calvinist, or a New York Times columnist (“when the revolution comes …”), I’d have more to say about this. But I’m not, so I’ll end this post by pointing to a delightful 2005 Q&A regarding edible gold that ran in the Washington Post. Worth a read. Gregory – Thanks for the numbers! Had no idea. Jen – I will admit that crossed my mind. 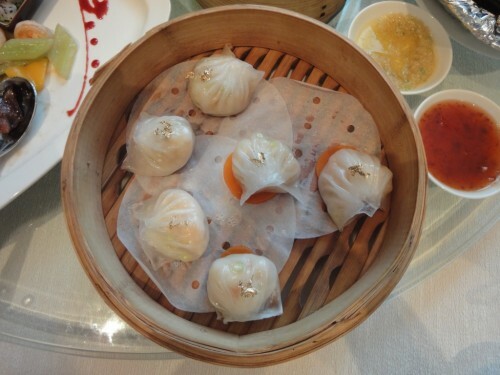 I had the gold leaf shrimp dumpling at Shang Palace in Shenzhen in 2009. It was 98 Yuan for all the dim sum, but they only serve it once. At least your host only ordered you gold sprinkled dumplings. We had to eat sea cucumbers!